Another Lee Carter brace and goals from fullbacks Andy Edwards and Andy Kirkham complete a 4-0 win in Cliffe FC’s opening B&P Sports Cup fixture. The score line read 3-0 at half time, Lee Carter scoring both his goals inside the area. The third goal from Andy Edwards was a cross that evaded everyone including the ‘keeper and ended up in the back of the net, 3-0 HT. Keith Tiplady shuffled the pack during the second half as Cliffe played good football in parts. Andy Kirkham made the final score 4-0, breaking free from his marker on a set-piece and forcing the ball past the ‘keeper using his chest, 4-0 FT.
Tom Robinson earned himself Cliffe FC Man-Of-The-Match on his first outing in a Cliffe shirt. LRB Trophies Opposition Man-Of-The-Match was awarded to Collingham’s Mark Gouland. Next Saturday pre-season friendlies continue, Cliffe FC Reserves travel to face Brooklyn Reserves. 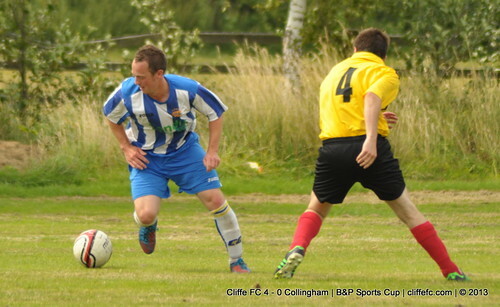 Whilst Cliffe FC face Goole Utd in their second B&P Sports Cup match. Harris, Kirkham, Edwards, Hogg, Pears, Beckram, White, Taylor, Cawkill, Robinson, Carter. Subs – Dunning, N. Leach, Grundy. 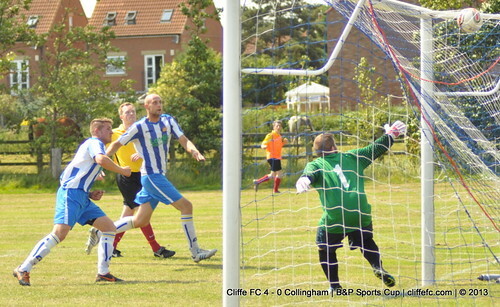 Cliffe FC Goals: Carter (2), Edwards, Kirkham. Cliffe FC MOTM: Tom Robinson. LRB Trophies Opposition MOTM: Mark Gouland.